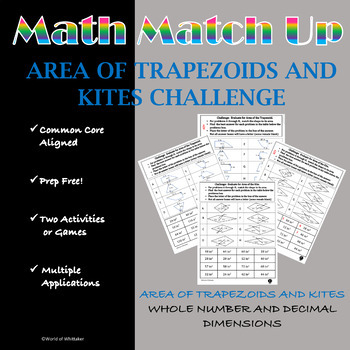 This matching activity practices the skills related to finding the area of trapezoids and kites. Using a variety of trapezoid and kite illustrations, students must apply both their working knowledge of shape notation and elements of trapezoids and kites to determine each shapes correct area. This Match-Up contains two separate challenges. The first challenge activity provides the task of finding the area of trapezoids with whole number dimensions. Challenge activity two requires evaluating for the area of kites with whole and decimal dimensions. Math Match-Up Challenges are perfect skill reinforcement and practice activities that can be implemented in a variety of capacities. Partner or small group activity. Independent practice or center activity. A favorite application is offering this as a whole class game! Have students in pairs or groups no larger than 3. Each pair/group has copies of both challenges as a paper copy, or ideally laminated together (Challenge One and Challenge Twp back to back) or inside a laminated envelope. One side at a time, students use their skills to complete each task to criteria established by the teacher. Students love Math Match-Ups as a game! !